IDX email alerts are pretty amazing. Home buyers want updates on the latest listings and real estate agents want to stay in touch with buyers on a regular basis. The solution is simple: IDX email alerts. Buyers see the value in getting access to the latest listings, so by offering updates via email, agents have an easy solution for staying in touch with their leads (ie: home buyers). Best of all, IDX email alerts are fully automated. As soon a buyer registers on your site and saves a property search, we’ll send them email alerts with any new listings that match their search. Chances are, all the leads who signed up on your site were forced to do so. Users either ran out of “free” searches or listing views and had to signup to continue, or they otherwise tried to access a feature that forced them to register (such as saving a property). Either way, most leads were forced to give up their name and email and create an account. Email – in particular listings via email – provide a great way to let your clients know you are awesome (and so is your IDX). Listing updates keep your name on a client’s mind as they look for their home, and over time, the value of these emails can help clients forget they had been forced to register. Our listing alert emails have evolved over time, so here’s a list of the features that we’re currently packing into these emails, plus some tips for optimizing your IDX account. 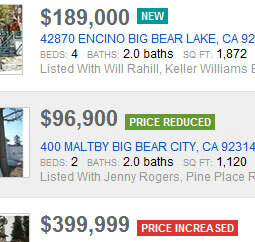 When buyers save a search on your IDX, they are prompted to give the search a name. Hopefully, they use something descriptive like “Irvine in our budget” or “Next to schools we like”, as we’ll use this in the subject line of their listing alerts. If your clients are doing a bad job naming their searches, you may want to login to their account and rename their search(es) for them. By default, all your IDX emails will display a basic header with your logo, name, and contact information. It can be a bit large and repetitive for users to see this same info in every email, so you’ll probably want to disable this header and create your own (discussed in detail below). We offer the ability to add your own custom links, images, text or any other HTML to your IDX emails. If you take advantage of this option, your content will appear here. Before we get to the listings, we offer users a quick, one-click unsubscribe option. It’s federal law that we include this option somewhere in the email; but we’ve specifically placed it above the listing data to address MLS IDX policies and to ensure agents are not spamming users. One bad apple spamming contacts would affect all of our agents, so we make sure it’s easy for anyone to unsubscribe. Adding your own custom content (including links to your site and images) can help de-emphasize the unsubscribe link if it’s a concern for you. Above the list of properties is a heading that incorporates the name of the saved search. 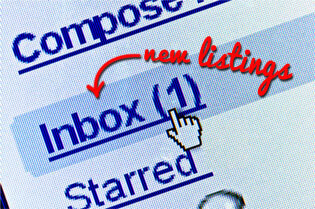 Each email contains up to 35 listings. This include both listings that are recently added as “Active” in the IDX feed, as well as existing listings that had a price change, new photos added, or had other fields (such as description) edited or added. We include the price, full street address, MLS number, beds, baths, sq ft, and the primary photo for each listing. We also include the listing source information, where required by your MLS. Buyers can click on any of the listing details or on the Details button to open the listing in full detail on your website. If a buyer clicks on a listing from their mobile phone, they will view the listing on the mobile version of dsSearchAgent IDX. 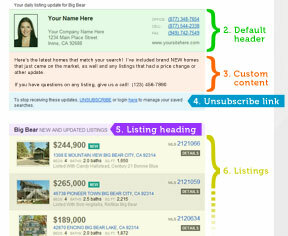 Earlier this year we added colored tags to help buyers identify listings in each email. Some listings may have more than one tag, and others may have no tags at all. We only send an email (daily or weekly) if there is at least 1 new listing or 1 updated listing in our IDX feed that matches one of their saved searches. If there are no matches on a given day/week, your visitor will not receive an email that day/week. Listings are sorted with the newest listing data on top. This includes both new listings and recently updated listings. Each email includes 35 listings max. If there are more than 35 matching listings on a particular day, only the top 35 will appear in the email. 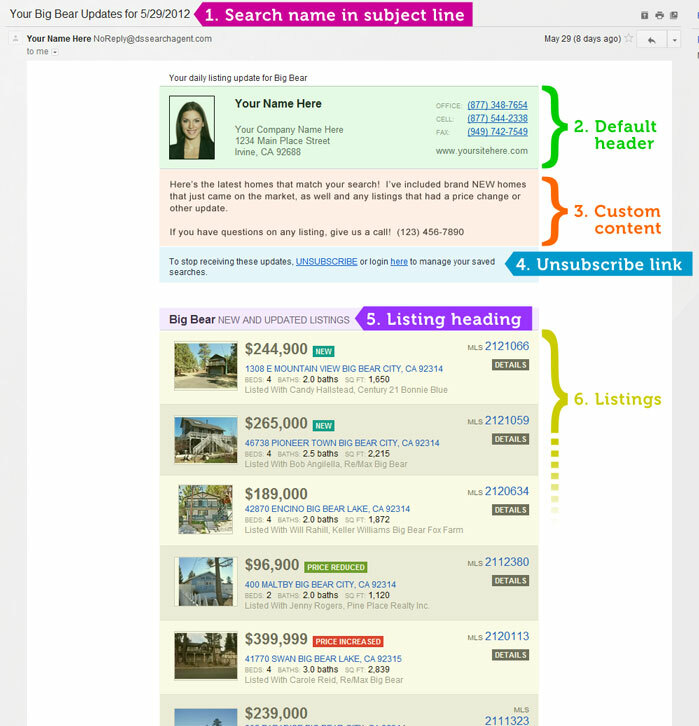 A visitor must save a search in order to get listing updates. Visitors get a separate email daily (or weekly) for each search they save. Here’s what you can do. First off, pimp out your IDX welcome email. As soon as someone registers on your site, we send them a “welcome email” to confirm their sign up. By default, this welcome email is very basic. The subject line is “Welcome to dsSearchAgent” and inside it has your name, contact info, a link to your site, and the words “Welcome to dsSearchAgent, we hope that you find the home of your dreams”. It also includes a link to unsubscribe. This initial email is the first point of contact most agents have with any lead from their real estate website. It’s fundamental that you customize your IDX welcome email to make a lasting first impression on potential clients. 1. Customize your IDX welcome email subject line. 2. Customize your IDX welcome emails. “Wow” your site leads with your welcome email. Your contact info alone won’t do it. Now’s the time to differentiate your site and IDX from the competition. Most potential home buyers who register are only researching homes, so show off your site’s bells and whistles and demonstrate the value that you can offer them at this stage. *Users will only get listing alert emails if they save a search — so this tip is very important! Ultimately, you want anyone reading this email to see all the benefits your site offers, and know they now have exclusive access to MLS listing data because they registered on your site. Plus, by emphasizing the perks you provide with their new account, users can feel empowered in their decision to register. Some buyers are going to get your IDX alerts every day. Others less often. It’s important that you customize these emails so buyers know why they are receiving the emails, why certain listings are included or excluded, and that this awesome service is provided by you! Our IDX alert emails include both new and updated listings. It may be worthwhile to explain the difference to buyers and encourage them to contact you with any questions, particularly if they notice price drops or other changes on listings they are interested in. Similar to your welcome email, you want buyers to see the value in the listing alerts and not simply write them off as spam. Encourage further IDX engagement through search refinement and favoriting listings to ensure buyers are only getting listings they care about while offering friendly help via phone, or email so buyers know where to turn when they are ready for the next step. By default, we include a big header with your contact info at the top of all your IDX emails. This header pulls your agent photo, company name, and other info from the Agent Info tab of your IDX Options. It provides basic branding and gives buyers an easy way to contact you, but it’s not the most personal greeting for your emails. By disabling our default header, you have the opportunity to create your own fully-branded email header. Use a custom-sized logo, get rid of unnecessary contact info, and otherwise create an email tailored for your buyers. To make changes to your IDX email headers, content or subject lines, log in to IDX Options area of your Control Panel here and click the Emails tab. You can enable or disable the default email headers by checking the “Show Header…” checkboxes. In the example below, the initial “welcome” email will show the standard contact-info header, but the daily/weekly listing alert emails will not show the standard header. The subject line for the listing alert email is auto-generated from the saved search name and cannot be edited. However, to make changes the subject line for your welcome email, scroll down to the Welcome Email Subject box to add your own custom message. If this box is left blank, we’ll use our standard subject line: “Welcome to dsSearchAgent”. We offer a full WYSIWYG (What You See Is What You Get) editor in your admin to make it easy to make changes to your IDX emails. You can add your logo and photo, use custom fonts and styles, or even paste in your own HTML code. 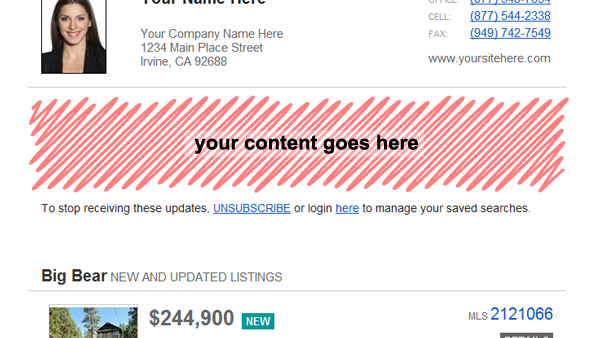 You can make changes to your listing alert emails a bit further down the page below the Result Email Body header. Ok, that should prove it. Call ‘em “new listing alerts”, “IDX emails”, or whatever-you-like, automated emails sent to your clients with new listings are fantastic. Buyers want up-to-the-minute access to new listings, and you have the IDX that makes it easy. Go forth and be awesome. Thanks Robert, this post is very helpful. Maybe you could do a similar post on how to effectively use the DS Agent Reach drip email campaigns. Thanks again. Glad to hear… I’ll see what I can put together re: Agent Reach. Thank you Robert for sharing some insights into helping us interact with our clients. Not all of our online consumers save their own searches…so we save searches for them. Have a fun weekend.